At Lawyer Legion, we understand the importance of specialty certification programs. We created a feature on our directory to narrow the search to only New Mexico attorneys who have earned specialty certification. 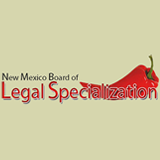 The New Mexico Board of Legal Specialization provides the public with a list of current board certified specialists who have demonstrated a certain threshold of competency after an evaluation of the attorney's knowledge, involvement, experience in a particular field of the law. New Mexico's Rules of Professional Conduct Article 7, Rule 16-704 says only certified specialist attorneys may make statements implying "specialization" in legal advertisements. Improving the overall qualify of legal services in specialty areas of the law. Under New Mexico Rules of Professional Conduct, an attorney may say he or she is certified only if he or she is certified by the New Mexico Board of Legal Specialization, by an appropriate organization in another state, or by an organization accredited by the American Bar Association. Proctors in admiralty and patent attorneys barred by the United States Patent and Trademark Office do not need to seek state certification. Must submit to peer review so that other attorneys and judges familiar with the attorney's practice can comment. Lawyer Legion is not endorsed or approved by any state or national board certification program or by any bar association, including the State Bar of New Mexico.